Today on Parliament Hill, Lieutenant-General Paul Wynnyk assumed command of the Canadian Army from Lieutenant-General Marquis Hainse. The Chief of the Defence Staff, General Jonathan Vance, presided over the event. Lieutenant-General Wynnyk is transitioning from leadership of the Canadian Forces Intelligence Command and Lieutenant-General Hainse will be moving on to become Canada’s senior military representative to NATO in Brussels, Belgium. The Canadian Army maintains a high state of training and readiness to provide land surveillance and combat-ready forces to protect Canadians and Canadian interests at home and abroad. “I would like to thank Lieutenant-General Hainse for his steadfast leadership, operational focus and for his strong voice and actions in our mission to eliminate inappropriate behaviour and sexual misconduct. A leader who leads from the front, after the terrible events of October 22, 2014, he offered to take the first shift on our national cenotaph. As we expand our footprint on NATO operations, he is the right choice to be the Canadian Armed Forces’ military representative in NATO. To his successor, Lieutenant-General Wynnyk, I offer congratulations as he takes command of Canada’s Army. I am confident he will skillfully lead the Army in its primary role of defending Canada, at home and abroad. Lieutenant-General Wynnyk has held a variety of operational and staff assignments both nationally and abroad, including postings to Europe, Africa and Southeast Asia. He was appointed Deputy Commander of the Canadian Army from 2012 to 2014 and since July 2014, he has served as Chief of Defence Intelligence, overseeing the Canadian Forces Intelligence Command. Lieutenant-General Marquis Hainse has served in several international and domestic operations, with leadership positions in Europe, Haiti and Afghanistan. He served in several key National Defence Headquarters roles in Ottawa, including Chief of Staff of Canada Command and as Deputy Commander Allied Joint Force Command in Naples, Italy. He assumed command of the Canadian Army in 2013. The Change-of-Command ceremony took place at Parliament Hill and was attended by a 100-soldier marching and band contingent comprised of members of the Ceremonial Guard. Displays of military equipment were showcased during the event. 4,100 civilian employees who support the Army. 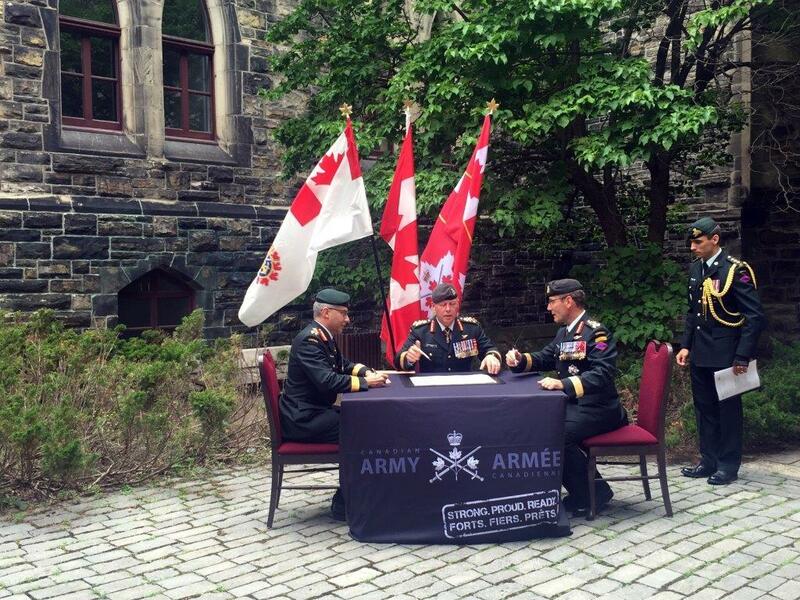 Lieutenant-General Marquis Hainse, formalizes the hand-over of leadership of the Canadian Army to Lieutenant-General Paul Wynnyk during a formal ceremony held on Parliament Hill in Ottawa on July 14, 2016. General Jonathan Vance, Chief of the Defence Staff, presided over the event.